The aim of this systematic review was to provide an overview of the available effective interventions that enhance work participation of people with a chronic disease, irrespective of their diagnosis. A search was conducted in PubMed, EMBASE, PsycINFO, CINAHL and the Cochrane Library, searching for systematic reviews published between 2004 and February 2015. 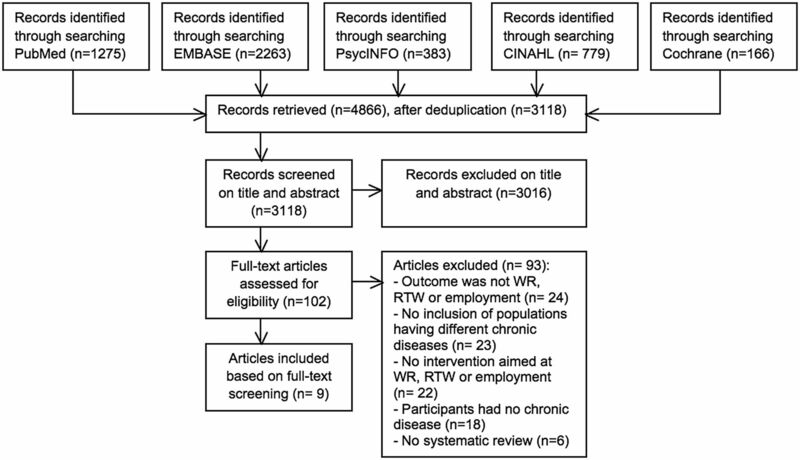 Systematic reviews were eligible for inclusion if they described an intervention aimed at enhancing work participation and included participants of working age (18–65 years) with a chronic disease. Reviews had to include populations having different chronic diseases. The quality of the included reviews was evaluated using the quality instrument AMSTAR. Results of reviews of medium and high quality were described in this review. The search resulted in 9 reviews, 5 of which were of medium quality. No high quality reviews were retrieved. 1 review reported inconclusive evidence for policy-based return to work initiatives. The 4 other reviews described interventions focused on changes at work, such as changes in work organisation, working conditions and work environment. Of these 4 reviews, 3 reported beneficial effects of the intervention on work participation. Interventions examined in populations having different chronic diseases were mainly focused on changes at work. The majority of the included interventions were reported to be effective in enhancing work participation of people with a chronic disease, indicating that interventions directed at work could be considered for a generic approach in order to enhance work participation in various chronic diseases. Previous research shows that having a chronic disease negatively affects work participation; people with a chronic disease are less often employed4 ,5 and, when they are employed, experience difficulties in meeting physical or psychosocial work demands.6 On the other hand, earlier research has shown that most people with a chronic disease want to participate in work and that work contributes to a higher quality of life.7 With this knowledge, efforts should be directed at improving work participation of people with a chronic disease. Research on interventions that aim to improve work participation is widely available and is frequently focused on populations with specific diagnoses, eg, workers with low back pain,8 arthritis9 or cancer.10 These interventions often contain common strategies or elements, either as single interventions or as part of a programme, such as job accommodations, encouragement, education, empowerment or self-management strategies. The wide application of these common interventions in people with various chronic diseases, implies that these interventions are possibly applicable irrespective of the underlying diagnosis. However, since the interventions are studied in specific diagnoses, it is not clear if these interventions could actually be used as a generic approach. Therefore, in this systematic review, we are interested in interventions examined in populations having different chronic diseases, in order to provide insight into which generic intervention strategies are available to improve work participation of people with a chronic disease. A generic approach enhances the insight of occupational health professionals regarding which interventions could be applied to enhance work participation without focusing on a specific chronic disease, or which interventions could be implemented in diagnoses in which evidence of effective interventions is lacking. Since many studies focus on interventions to enhance work participation of people with specific diseases,8–11 we included systematic reviews that gathered these specific studies in an overall review including populations with different chronic diseases. In addition, we performed a systematic review of reviews because we wanted to systematically conduct a synthesis of the highest available evidence on effective interventions in the field of occupational health. We strived to answer the following research question: Which effective generic interventions are available in enhancing work participation of people with a chronic disease? An extensive search was performed in PubMed (MEDLINE), EMBASE (Ovid), PsycINFO (Ovid), CINAHL (EBSCO) and the Cochrane Library, searching for records published between January 2004 and February 2015. With the help of an experienced librarian, we developed a search strategy, using published search strategies by Haafkens et al13 and Lee et al.14 Search terms included synonyms of the terms ‘work retention’ (WR), ‘return to work’ (RTW) and ‘employment’ in combination with both synonyms of the term ‘vocational rehabilitation’ and synonyms of the term ‘systematic review’. The strategy was formulated in PubMed (MEDLINE) and was adapted for use in the other databases. A full description of the search strategy is presented in the online supplementary material. Abstracts of all records were retrieved and duplicates were removed. Selection of the reviews was conducted in two rounds. The first round consisted of the title and abstract screening in which the first reviewer (MV) screened all the retrieved records. Each of the four reviewers (MCJL, JLH, HW and MHWF-D) screened a quarter of the records independently. Records were screened on study design, language, outcomes and population. Systematic reviews of quantitative, qualitative or mixed-methods studies were included that were written in English, Dutch or German. The systematic review had to describe an intervention aimed at the improvement of WR or RTW of people with a chronic disease. We defined WR as preventing work loss or staying employed. RTW was defined as re-entering employment in the same job or in a different job after a period of sickness absence. When the title and abstract did not fulfil one or more selection criteria or the abstract was not available, the record was excluded. When there was not sufficient information in the title and abstract to judge eligibility, the full-text article was retrieved. In the second round, full-text articles were retrieved and records were selected independently by two reviewers (MV and MCJL) based on the criteria: participants were of working age (18–65 years) and had to have been diagnosed with a chronic disease for more than 3 months, according to the definition of chronic disease of the National Centre for Health Statistics.15 In addition, reviews had to include populations having different chronic diseases. Records were excluded if full-text was not available or when the review did not include information on search strategy, number of included studies or details of included studies. The references of all included reviews were checked for additional relevant publications. Disagreements during the process of selection were resolved by obtaining consensus during a meeting with the other reviewers. The quality of the included reviews was independently assessed by two reviewers (MV and MCJL), using the quality instrument AMSTAR.16 ,17 Criteria addressed were: (1) provision of ‘a priori’ design; (2) independent study selection and data extraction; (3) performance of comprehensive search; (4) inclusion of grey literature; (5) provision of a list of included and excluded studies; (6) provision of characteristics of included studies; (7) assessment of the quality of included studies; (8) appropriate use of quality in formulating conclusions; (9) use of methods to appropriately combine data; (10) assessment of publication bias; and (11) reporting of conflict of interest. The criteria could be scored as ‘yes’, ‘no’, ‘can't answer’ or ‘not applicable’. Scores could range between 0 and 11, which were classified as follows: low-quality (score between 0 and 4) medium-quality (score between 5 and 8) and high-quality (score between 9 and 11). Data were extracted by one reviewer (MV) and checked by the other reviewers (MCJL, JLH, HW and MHWF-D). Data extracted were study characteristics (author, year, country, number and type of studies included), patient characteristics (diagnosis, number of included participants, age of participants, gender of participants and percentage of participants employed at baseline) and intervention characteristics (type of intervention, aim of intervention, content of intervention, disciplines providing the intervention, type of outcome and the results of the intervention). When the systematic reviews included various outcomes, information related to the outcomes WR or RTW was selected. Only data related to people having a chronic disease and data regarding paid employment were extracted. Data were synthesised by qualitatively describing the interventions and their effectiveness, performed in either a medium quality or high quality review. The intervention was classified as effective when the authors of the review reported an overall significant effect of the intervention on the work-related outcomes (WR, RTW, employment). A total of 4866 records were yielded through the search strategy: 1275 from PubMed, 2263 from EMBASE, 383 from PsycINFO, 779 from CINAHL and 166 from the Cochrane Library. After excluding double records, 3118 records remained. Performing a title and abstract screening excluded 3016 records and identified 102 records for full-text selection. On the basis of the full-text selection, nine systematic reviews met the inclusion criteria and were included in this review. Checking the references of the nine reviews yielded no additional records. The results of the literature search and study selection are presented in figure 1. The list of excluded studies based on full-text inclusion criteria is provided in the online supplementary material. Flowchart of the selection of reviews (RTW, return to work; WR, work retention). The quality of the included systematic reviews was assessed using the quality instrument AMSTAR. As can be seen from table 1, of the nine included reviews, five were of medium quality18–22 and four were of low quality.23–26 No reviews of high quality were retrieved. Clayton et al18 focused on policy-based RTW initiatives, examined in observational and qualitative research. The review reported inconclusive evidence for the included interventions, that is, financial incentives, assistance in managing one’s health condition and individual case management. However, the authors concluded that these interventions could potentially help RTW, but that financial incentives were often set too low or were too short to have an effect, and that widespread selection of more work-ready claimants led to bias in the results. The three other reviews all reported on interventions effective in promoting work participation. Van Oostrom et al20 reported on workplace interventions including changes to the workplace or equipment, changes in work design and organisation, changes in working conditions, changes in work environment, or case management with worker and employer. It was reported that moderate quality evidence supports the use of these workplace interventions for time until first RTW when compared with care as usual (HR=1.55, 95% CI 1.32 to 2.16). However, the review concluded that no convincing conclusions could be formulated from the few available studies. Franche et al21 described workplace-based RTW interventions including work accommodation offer, early contact with the worker at the workplace, healthcare provider contact with the workplace, RTW coordination, worksite ergonomic visit, supernumerary replacement and assessment or treatment of a physiotherapist. Two randomised controlled trials (RCTs) reported that workplace-based RTW interventions led to a significantly higher RTW rate (OR 2.2, 95% CI 1.04 to 4.80) and faster RTW (OR 1.9, 95% CI 1.18 to 3.10), while one RCT reported no difference in time to first RTW (no effect size reported). Two other studies did not report effect sizes, but concluded that the intervention had a positive influence on RTW. The review concluded that the evidence supports the effectiveness of workplace-based RTW interventions. Nevala et al22 focused on work accommodations, which consisted of the redesigning of work schedules, work organisation and work environment, assistive technology, assistance of others, special transportation and legislation. The review reported and concluded moderate quality evidence of specific types of work accommodations (vocational counselling and guidance, education and self-advocacy, help of others, changes of work schedules, work organisation, and special transportation) helping to maintain employment (OR 0.58, 95% CI 0.34 to 0.99) and increasing employment rate (OR 5.61, 95% CI 2.23 to 14.09) among physically disabled persons. However, one controlled clinical trial (CCT) reported no effect of workplace accommodation on RTW in persons with physical and cognitive disabilities (OR 2.0, 95% CI 0.77 to 5.23). The aim of this systematic review was to provide an overview of the available generic interventions that were reported to be effective in enhancing work participation of people with a chronic disease. Since many studies focused on interventions to enhance work participation of people with specific diseases, we included systematic reviews that gathered these specific studies in an overall systematic review, examining interventions in populations having different chronic diseases. The retrieved interventions which were reported to be effective, were mainly directed at work and included changes in the work environment, changes in the work organisation and communication between the stakeholders involved. One review studied policy-based RTW initiatives, but reported inconclusive evidence for the examined interventions. Work participation is a complex process, in which the demands of one's work and the personal abilities to meet job demands need to be in balance. Since decreased physical or psychological health is associated with impaired functioning both in daily life and work,27–29 having a chronic disease could interfere with this balance by hampering the personal abilities to meet job demands, for example, through physical limitations, fatigue, pain, etc.30 Various factors influence the process of work participation which is either related to the disease or irrespective of diagnosis. Considering this last category, previous research indicated that work participation is influenced by both personal factors (eg, age, education,31 gender,31 ,32 prediction of one's own RTW31 ,33) and work-related factors (eg, heavy manual work,32 perceived control over work situation33). Interventions to enhance work participation should therefore aim to restore the balance between personal abilities and job demands by modifying factors associated with work participation. This could be done either by making changes in the individuals themselves by enhancing person abilities to meet job demands, or by making changes in work by adjusting the work demands. In our search for interventions applicable in populations having different chronic diseases, the interventions that were reported to be effective were mainly focused on changes at work. This could indicate that interventions aimed at changes at work are more prone to facilitate people with a chronic disease, irrespective of their diagnosis, than interventions aimed at making changes in the individuals themselves. It is possible that personal factors are more closely linked with the specific chronic disease of the worker, versus work-related factors which have no direct link with a specific diagnosis. In addition, some personal factors, irrespective of the diagnosis and association with work participation, are not amenable to change (ie, age, education, gender), which is in contrast with the work-related factors (ie, heavy manual work, perceived control over work situation) that could generally be modified by the interventions retrieved in this systematic review. The majority of the retrieved interventions in this systematic review consisted of diverse combinations of multiple components, like workplace assessment, changes in the work environment or organisation, assessment and treatment of a physiotherapist, vocational counselling and guidance and education. This multicomponent approach is consistent with previous research indicating that interventions including multiple components are likely to be more effective than interventions consisting of a single component.34 Since the retrieved interventions consisted of multiple components, it is not known which component is the most effective and useful in practice in enhancing the work participation. A limitation of performing a systematic review of reviews is that, owing to the inclusion of reviews on the same subject, studies reported in reviews could overlap. In our systematic review, three studies were included in more than one review, which consequently could influence the conclusion. We found that excluding these studies would not change the results of the included reviews, with the remaining studies still reporting a positive effect of the interventions on work participation. Therefore, the overlapping studies did not change the conclusion of our systematic review. Another limitation is that, in our aim to include interventions which can be implemented in various chronic diseases, the total independency of diagnosis cannot be proven. However, interventions retrieved in this review were examined in populations including patients having both physical and mental diseases, indicating that these interventions are effective in enhancing work participation in a broad population. Finally, although all reviews included one or multiple RCTs, CCTs or pre-post design studies with a control group, most reviews also included studies of inferior designs, limiting the strength of the evidence. For that reason, we could not prevent the limited available quality of some included studies and the lack of high quality reviews regarding this subject. In addition, since the reviews frequently did not report the effect sizes of the intervention group, control group or both, there was not always a clear insight into whether the differences in effect sizes were clinically relevant. However, this systematic review strived to provide the highest available evidence by critically examining the quality of the included reviews and basing the conclusion on the medium quality and high quality reviews. More high quality research should examine if other interventions could be implemented in populations having different chronic diseases. Many reviews provide interventions for specific diseases in an acute phase. This review adds by providing interventions for people with a chronic disease who need to participate at work in the long term. Most of the reviews included in this systematic review reported favourable results for work-directed interventions. Although the interventions described in this review included participants with different types of chronic diseases, we cannot exclude the possibility that patients with certain chronic diseases would benefit less or more from certain intervention components. However, this systematic review provides an overview of interventions directed at work which were reported to be effective in populations having different chronic diseases, indicating that interventions directed at work can be applied more broadly than only for a specific chronic disease. Work-directed interventions could therefore be considered by occupational health professionals as a generic approach in order to enable patients with a chronic disease to retain work or RTW, which could be tailored to the patient's needs. In addition, a generic approach could be used in practice for people having a chronic disease in which evidence of effective interventions is lacking. In this systematic review of reviews, we identified several generic intervention strategies. However, almost half of the reviews were of low quality. In addition, many reviews did not include controlled studies in order to compare the effect of an intervention on work participation with care as usual or an alternative intervention. Further reviews should take these limitations into consideration, by including high quality research and by including more controlled studies performed in populations having different chronic diseases. Although several intervention components such as workplace assessment, workplace accommodations, changes in work environment, changes in work organisation, changes in work conditions and case management are described, it is unclear through which mechanisms the interventions are effective, and which of these components are most effective. Since previous research indicates that multicomponent interventions are likely to be more effective than interventions including a single component,34 there is a need for research that examines which combination of components is most effective in enhancing work participation of people with a chronic disease. Various interventions were retrieved that were examined in populations having different chronic diseases. Of these interventions, one review examined interventions focused on policy-based RTW initiatives, which reported inconclusive evidence for the included interventions. The retrieved interventions were mainly focused at changes at work, of which the majority were reported to be effective in enhancing work participation. This could indicate that interventions directed at work could be considered for a generic approach in order to enhance work participation in various chronic diseases. The authors would like to thank Joost M Daams for his assistance in designing the search strategy. World Health Organization. The World Health Report 2002—reducing risks, promoting healthy life. WHO, 2002. http://www.who.int/whr/2002/en/ (accessed 10 Ma 2015). World Health Organization. Global Status Report on noncommunicable diseases 2010. WHO, 2011. http://www.who.int/nmh/publications/ncd_report_full_en.pdf (accessed 6 May 2015). European Commission Eurostat. Health status statistics—statistics explained (2014/2/3). European Commission Eurostat, 2014. http://epp.eurostat.ec.europa.eu/statistics_explained/index.php/ Health_status_statistics (accessed 10 Mar 2015).
. Kennissynthese ‘Chronisch ziek en werk’: Arbeidsparticipatie door mensen met een chronische ziekte of lichamelijke beperking. Utrecht, Holland: Nivel, 2013. Australian Institute of Health and Welfare. Chronic disease and participation in work. Canberra, Australia: Australian Institute of Health and Welfare, 2009.
. Is work good for your health and well-being? Norwich, UK: The Stationary Office, 2006:1–246. National Center for Health Statistics. United States 2010. With special feature on death and dying. Hyattsville, USA: US Government Printing Office, 2011:486–7.
. Chronic musculoskeletal pain and arthritis: impact, attitudes and perceptions. Ir Med J 2008;101:208–10. Funding This study was granted by the Instituut Gak.